Like a couple other parts on the stock Jeep Wrangler, the factory steering stabilizer just seems to cry out “help me”. I hear it every time I experience Jeep death wobble, which up to this point in time, I had been blaming entirely on tires with differing air pressures. If anything needed some aftermarket beefing up, it had to be this part. 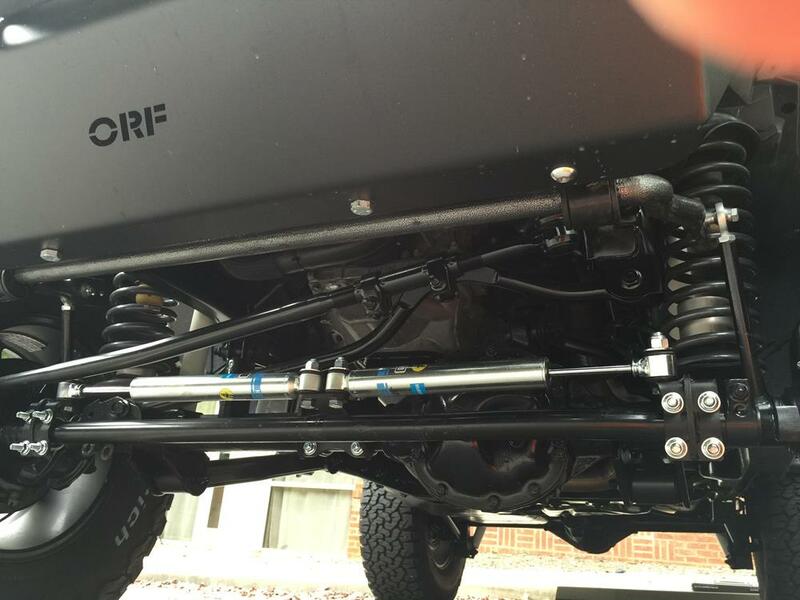 We have gotten to know the guys at FORTEC 4×4 over the last year. They have locations in Roswell, GA and Pompano Beach, FL, they put out a catalog with some pretty great Jeep packages, and they even have some exclusive designs on accessory parts. 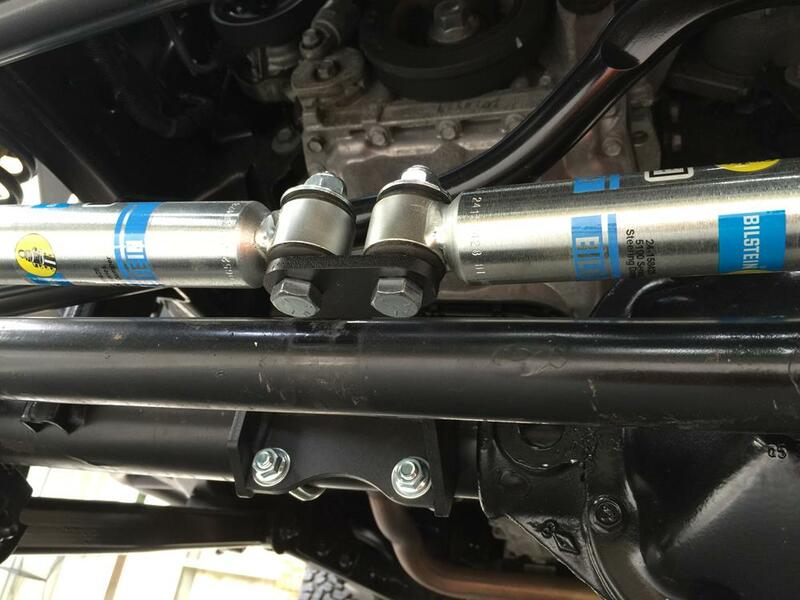 The FORTEC Dual Steering Stabilizer Kit, FT 24-158428-2, stood out as just what I needed to gain better handling and improved ride quality for my Wrangler. The kit contains (2) Bilstein 24158428 shocks, (1) center stabilizer bracket, (2) tie rod brackets, and all necessary hardware. I completed this part of the build at T&A Offroad with Art Caldwell. I seem to have a sixth sense that tells me when I am starting a project under-manned in the tool category. My sense proved to be right in this case as usual. Before doing anything, I would recommend taking of the factory stabilizer (not what I did). The most difficult part is bending the center bracket open to get it off of the tie rod. This step required some large crowbars, some serious elbow grease, and a few loud grunts. After all that, I just put this part out of its misery! I mounted the FORTEC center stabilizer bracket flush with the front differential housing. I attached the (2) tie rod brackets with their offsets towards the center of the vehicle. Make sure to put the bolts that hold the shocks through the brackets before mounting the brackets to the tie rods (this part I did correctly). I mounted all brackets loosely so that I could adjust them once the shocks were added. I lifted the Jeep high enough that the wheels could be turned back and forth. After loosely bolting in the Bilstein shocks, I checked for interference with any parts on the underside of the Jeep. Art pointed out that the tie rod brackets were just touching the end link arms so I angled them slightly forward to gain the needed clearance. 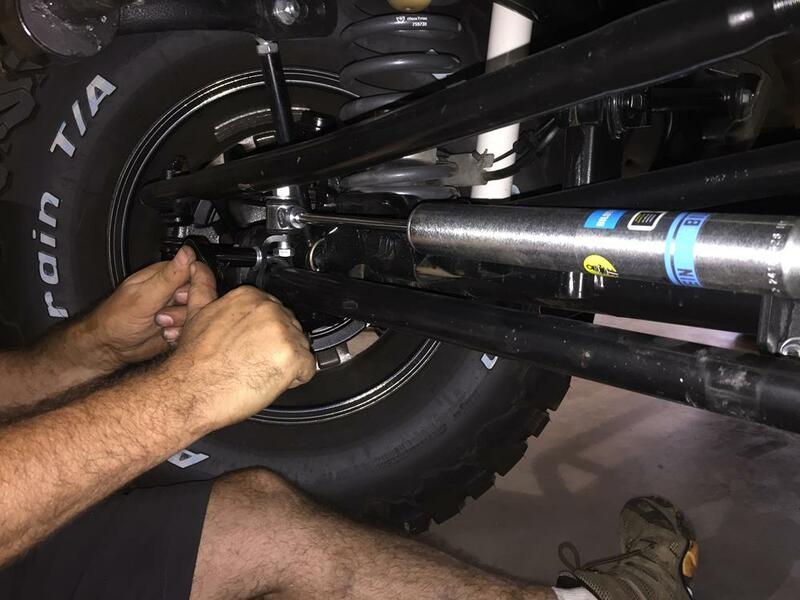 I turned the Jeep’s wheels hard right and Art moved the tie rod bracket inwards, with the right Bilstein shock remaining at its full travel position. Art tightened the tie rod bracket in place. 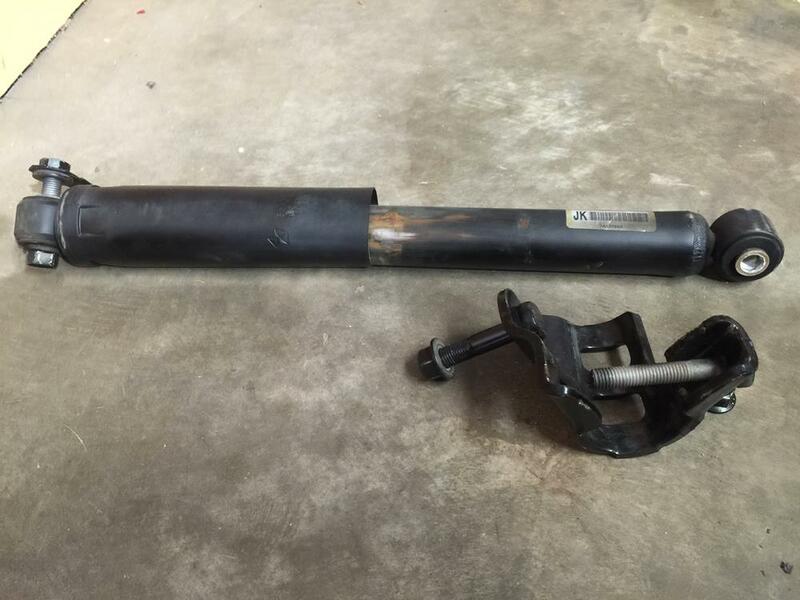 I turned the Jeep’s wheels hard left and found that the left Bilstein shock was at its full travel position right where it was, butted up against the tie rod adjustment bracket. I tightened the tie rod bracket in place. After lowering the Jeep and making sure the (2) shocks were level, I tightened the center bracket. We made sure that the bolts holding the shocks were properly tightened as well. I did not have time to make sure the air pressure in all of my tires was the same on the way over to Art’s place. No matter, the ride I experienced on the way home was dramatically different than on the way there. Just as advertised, the Jeep’s ride quality smoothed out and the steering tightened way up; I was not expecting that benefit. The added steering control is really unbelievable. A great improvement and no more parts crying out to me from under the Jeep!